If you are trying to login to Certificate Holder Maintenance Internet site and you know your bidder number but do not remember your password you may choose the option to have your password sent to you via E-Mail. 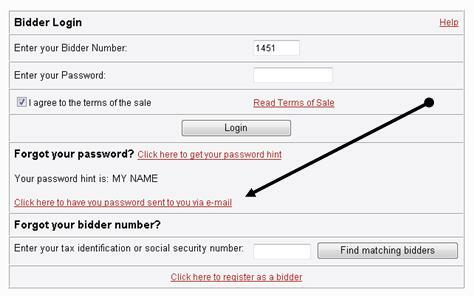 On the Send Bidder Password screen enter your bidder number, SS # or Fed ID #, and your E-mail address. If the bidder number matches the SS # or the Fed ID #, and the E-Mail address matches the one we have on file we will send the password to the E-Mail address. If you need any other assistance logging on please contact us.